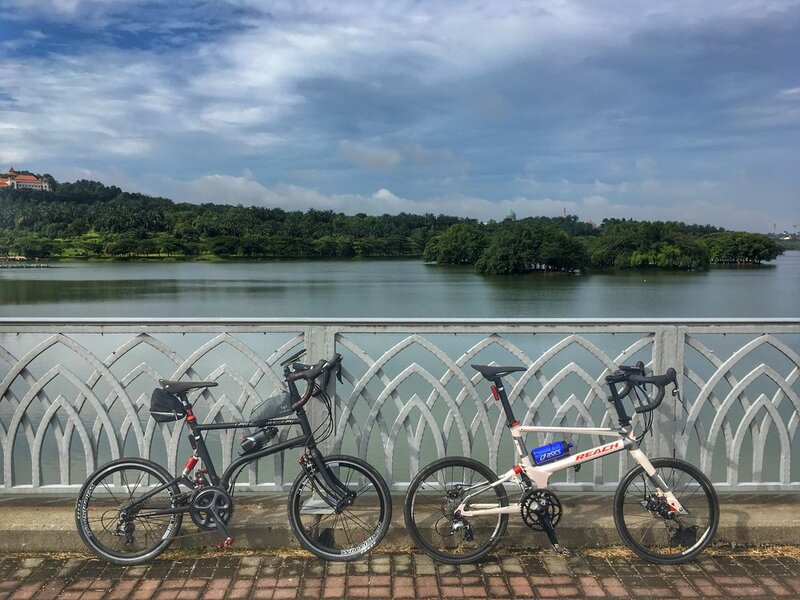 If you’re a frequent visitor to Folding Tales, you would undoubtedly have come across Eka’s review of the Reach bike, which is a modified version of the T20 that he likes to call an R22 – It runs on dropbars with an upgraded SRAM Force 11-speed drivetrain. However, one fine day while procrastinating on work at the office, he came across another extremely intriguing Reach model. Unable to justify the purchase of a second Reach bike for himself, his solution was to send the link to me, thereby planting the seed of yet another acquisition (read:purchase/buy). Obviously he knew the strategy would work, because I fell in love with it. This Reach Racing was a sleek, mean machine, matt black in colour with bold red accents and a nice set of upgraded components. On paper, the specs looked pretty darn good. Carbon 3T Ergonova Team handlebars and matching 3T front stem, SLK carbon seatpost, Wheelsport Smart 2.0 wheelset, and Shimano 105 gruppo. 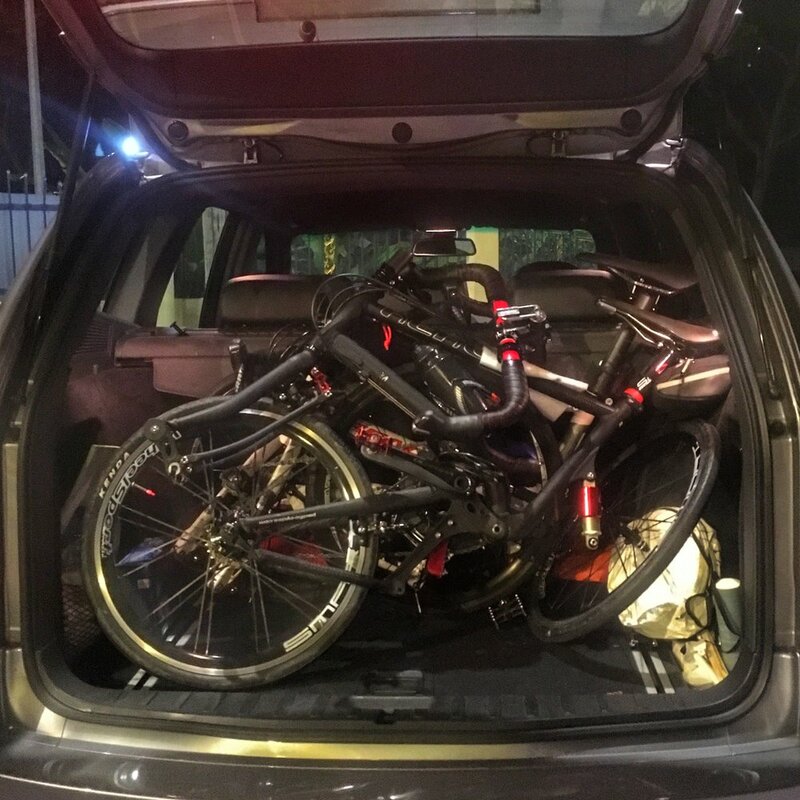 But it was a used bike and required a drive down to neighbouring Singapore, where Maya conveniently resides. Would it be worth the long journey and the price? It certainly looked like it, but we reasoned that we’d at least get some cycling in that weekend even if we opted not to go through with it. You may be a bit confused about the Reach bike models, since the Pacific Cycles site only lists the T20 and R20 for sale. Where does the Reach Racing fit in? To make it more mysterious, Eka and I also spotted a variant of the Reach Racing at Taipei Cycle 2017 back in March. It was running on the new 2015 frame set, but in a matt black finish. Attached was a 1x drivetrain Zele 56T combined with the SRAM Rival 11-speed derailleur. 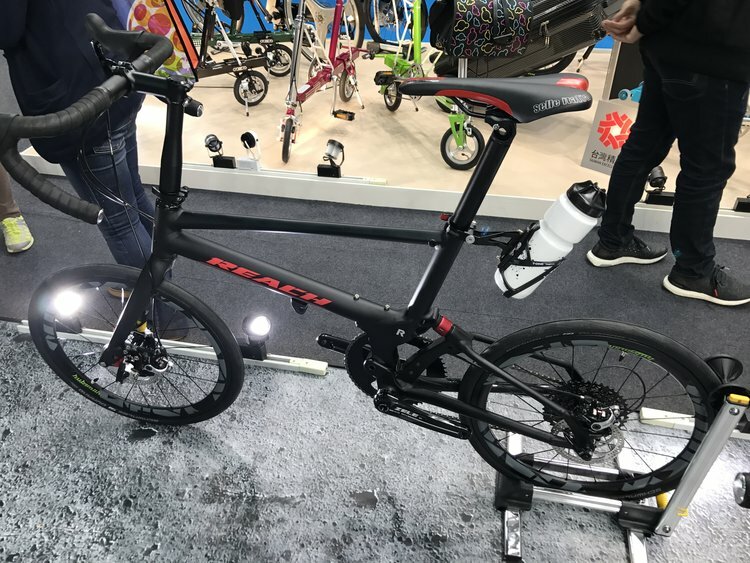 If you haven’t read our article on the trade show yet, there’s also the new Reach GT, a similar model to the T20 made for heavier off road riding. Essentially, it is the 2017 update to the T20. It’s quite distinct with its eye catching matt turquoise finish, although the shiny black finish like the R20 and T20 frame is also available. The GT model was fitted with the 1x drivetrain Zele 52T, with the SRAM Apex 11-speed derailleur. Going back to the beginning, the Reach came out 7 years after Pacific Cycles introduced the Birdy. The company’s R&D team had a mission, namely to create a performance folding road bike or minivelo, which packed small enough to make travel easy. This new foldie would not replace the Birdy per se, but would focus on speed instead. It needed a lightweight but stiff frame made of alloy, ride on small wheels and should be equipped with front and rear suspension. So what about the Reach Racing? I’d been enjoying riding the bike so much that I realised I hadn’t gotten around to writing a review, and I was still a bit unsure about its origins. Thankfully though, I’d met Pacific Cycles CEO Michael Lin at Taipei Cycle, and figured he’d be able to give me some insight. Besides posting a series of write ups about the design philosophy of the bike, he also gave me a clever little infographic that answered quite a few of my questions, and a lot of other information. From this you can see that my Reach Racing is the previous frame design, which is very different than the current-day model. The original is still sold as the Tartaruga, and is only available in Japan. It remains a cult favourite, and can be found in a few different variations. It also has a rear rack that allows the bike to be wheeled in folded form, in the same manner as the Birdy. Another version is the IF Reach, which shares design features from the folding urban IF bike, namely a break in the frame to make it more compact for commuting. Essentially, what I have was from the 3rd generation, and the last of the old frame set. Done up right, the Reach Racing is a pretty nimble bike, offering a 20% upgrade in terms of performance, if you compare it to the Birdy. However, even then it still has pros and cons when you compare it to the newer R20. As you can see, the newer R20 (introduced in 2015) has a beefier but lighter frame, updated to provide a more efficient and compact fold. From what I understand, the Reaching Racing is approximately 400gm heavier than the R20, which is a full 1kg lighter than the first generation of the bike. The geometry is not vastly different from a full sized roadbike, but the flex is minimal due to the compact geometry typical of foldies. The top tube measures 530mm - 20mm shorter than the R20, which means neither are ideal for petite/vertically challenged riders like myself (I am 154cm tall but with a shorter torso than my lower body). I get around my shorter reach by using a shorter front stem meant for fixed gear bikes that makes my Reach a little twitchier, and a saddle that is pushed as close to the handlebars as the rails allow. I could use a seatpost with a setback like the one on my Birdy, but obviously this isn't the best solution either, since it affects where I sit over the crank and pedals. Either way, the reach for both frames is still a bit longer for me than it should be. The front handlebars also sit taller on the Reach Racing, giving me more of an upright riding position unless I raise my seat to the point where I can’t tiptoe on the ground while seated. The new R20 also has a mounting point to secure the front wheel to the frame when folded, something the Reach Racing doesn’t have. The Reach Racing is a full suspension foldie, utilising a trailing link fork in front similar to those on the Alex Moultons. The rear has an adjustable suspension that may appear to be more sophisticated air shocks but I found out that it contains an elastomer, when I had it cleaned out during a bike service not too long ago (we ride in a lot of rain here in the tropics, so things get pretty dirty). In comparison, the R20’s front trailing link suspension is a completely new design, using elastomers that can be swapped out for your preferred hardness, to make it a stiffer ride or otherwise. The R20 rear suspension is a single elastomer block that can also be changed to control the stiffness. In a nutshell, the Reach Racing’s suspension is meant to dampen vibrations more than anything else, which means it is stiff and is at its best on roads. It is what Pacific Cycles calls a Unify Drivetrain system, which ensures zero energy loss when the rider is pedalling hard, is good for climbing and eliminates the “pogo effect” or pedal bob. However, there is little breathing room for the front suspension, meaning the brake mounts will take a knock on hard bumps and if you try to go off road. This is one of the biggest reasons Pacific Cycles opted to update the frame design. Both older and newer frames have a pivot point near the bottom of the down tube, that allows the rear triangle to swing under in the same manner as the Birdy. However, simply put, the Reach Racing’s fold is not as compact as the R20. Both require the front wheel to be removed in order to be folded, but the Reach Racing has the added disadvantage of requiring the rear suspension to be disengaged using an allen key. This takes a bit more time of course, even though no force is required to fold and unfold. The R20 is folded by pushing the rear fold down until the elastomer pops out of the metal pin that holds the rear fold secure. As you can see, the suspension is what links the rear to the down tube. Folded, the R20 can stand on its own and be wheeled, while the Reach Racing needs to be carried. At a little over 9kgs this sounds like no big deal, but if you’re in a hurry or have back problems you will feel the weight. The Reach Racing runs on rim brakes like most traditional roadbikes, while the R20 has been designed to be fitted with disc brakes. Both have their advantages and disadvantages obviously, and there are strong arguments for either side. For the Reach Racing the brakes limit the width of your tyres, since there is only a certain amount of space for the tyres to pass through when you have to take the front off. They are however less sensitive than the R20’s disc brakes, which you need to ensure don’t get bent out of shape. 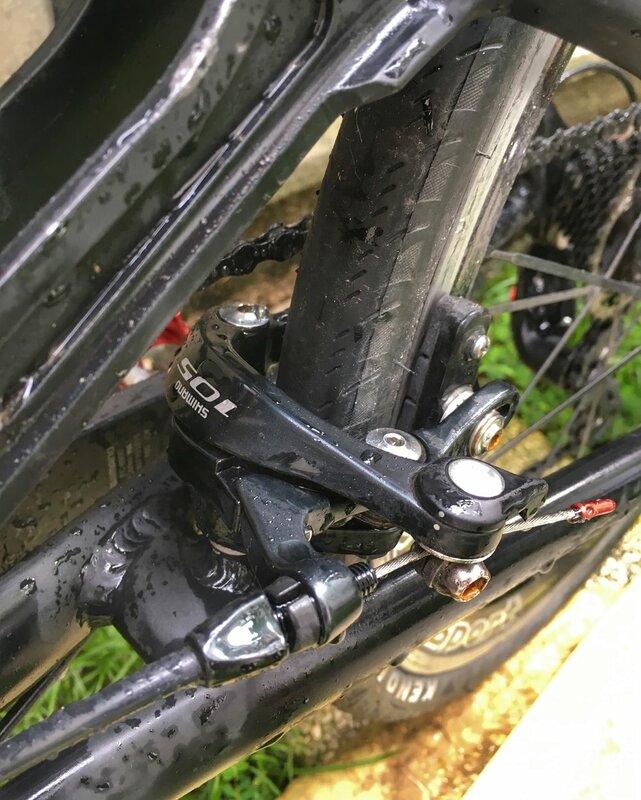 If you’ve read Eka’s review of the R20, you’ll know that the custom Pacific Cycles front wheel hub is one of his main (although few) complaints about the frame design. It has a floating through axle that makes taking the front wheel off a bit of a pain because it needs to be jiggled. Once in a while it will get stuck, particularly if grit gets in somehow. There has been an update to the design, but we’ve yet to get our hands on it so can’t comment on the new hub. The rear hub has no issues altogether, since it is a standard quick release drop out. From what we understand, the front was designed differently for more stopping power when combined with a disc brake system. In comparison, the Reach Racing uses universal standard quick release drop outs for both the front and rear. So how would you choose between the two? The easy answer is that the Reach Racing is only available on the used bike market, while the R20 is still in production. However, if you had the option of getting either, there are a few things you want to consider. Chances are if you come across a used Reach Racing, it will have a set of upgraded components that make the price pretty attractive. Since we have both in the foldingtales stable, we're in a pretty good position to tell you the pros and cons of each bike. Overall, the Reach Racing is the easier one to service in the field because of its less sensitive rim brakes. It's also slightly smaller in terms of frame size, while you have more choices for wheelset upgrades because of the standard hubs. The R20 is limited to wheelsets from Hubsmith and Pacific Cycles itself. However, the R20 has a more compact fold, which is also easier to manage. For travel, the R20 is more convenient, even having its own purpose built flight case. However, the Reach Racing is more resistant to problems when being transported because the design of the bike is much simpler. In terms of performance, we can't really say whether the R20 has an edge over the Reach Racing, since our R20 has not had a wheelset upgrade, while the Reach Racing has a pretty high end set. Once we upgrade the R20, we'll update this review again. When the front suspension bottoms out, the brake caliper hits the front fork. The folding mechanism isn't as compact or convenient as the R20. The bike can't be wheeled while folded. Even with these three disadvantages, I'd say the Reach Racing is still worth the money if you can get a good deal for it. While the R20 has the improved frame, its predecessor still has some tricks up its sleeve. It all boils down to which feature is more important for you in a folding minivelo.